The idea of "normal" search results died a little more today, as Bing has begun delivering personalized listings depending on a searcher's location or past search history. Google has already been doing the same for several years. 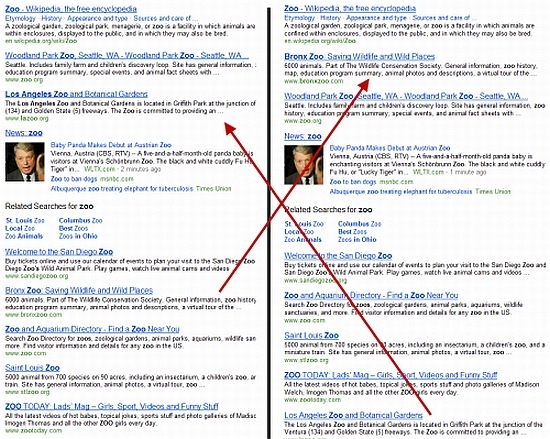 Until today, everyone searching at Bing within the United States generally saw the same results. Now, the city you're searching from can make a difference. You can see that for the Los Angeles-area results, the Los Angeles Zoo is listed higher than in the New York listings. Similarly, in the New York listings, the Bronx Zoo comes higher than in the LA listings. Outside the US, Bing has long been showing different search engine results considered more relevant to the country of the searcher. However, everyone within those countries will still see the same results, regardless of what city they are searching from, Bing tells.